I figured I’ll start the new year (nový rok) with a dish many consider to be Slovakia’s second national dish. It’s called fučka, and the name is derived from fučať, which means to huff or puff. That’s because, when done, the porridge will be wheezing with steam. Peel and cube several potatoes (zemiaky). While they are cooking, chop one small onion (cibuľa) and few strips of bacon (slanina). 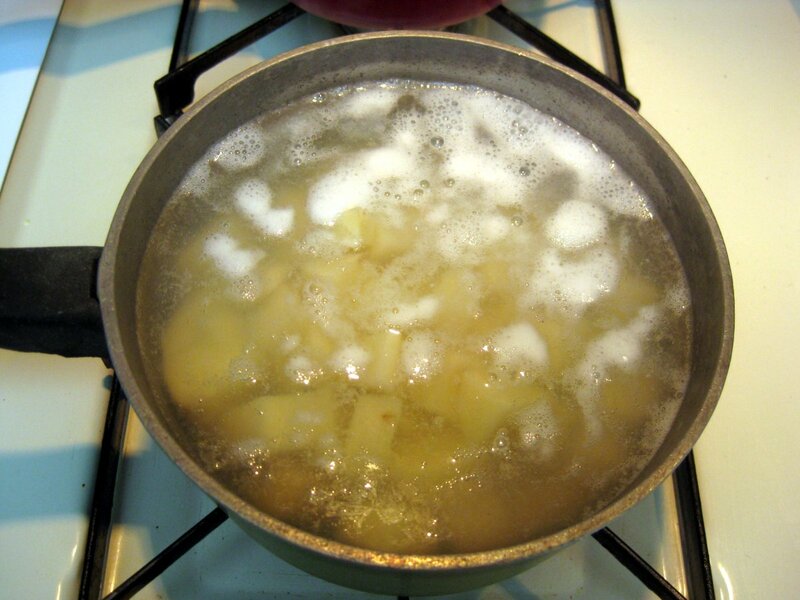 Once the potatoes get soft, strain most of the liquid out into a cup. 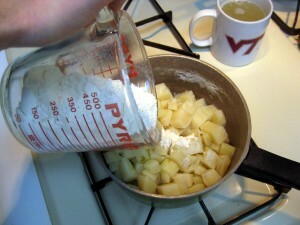 Add flour and mash everything together. Then add the liquid back. Also add salt to taste. Bring the porridge (kaša) back to boil while stirring so the potatoes don’t burn your pan. At the same time, fry the onion on small heat. I started by first frying the bacon on small heat to render the fat. After about 5 minutes, I added the onion and also a bit of butter. 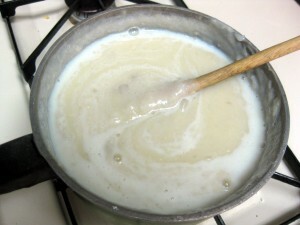 Cook the porridge until skin forms on top and the porridge starts “puffing” all over the place. 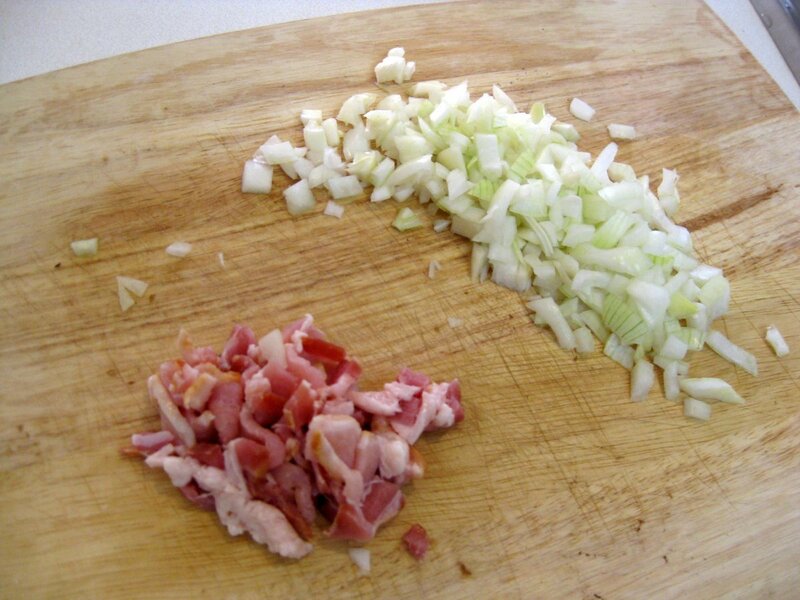 Fry the onions until they are crunchy. 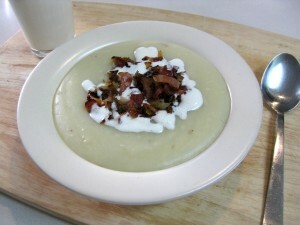 Top with the onions and bacon and serve with a glass of milk or kefir. There you have it, Slovakia’s second national dish! Fučka is one of those foods that surely originated during the times when the pantries were less plentiful than today. It’s a super rich and filling dish (sýte jedlo). You won’t be hungry again for half a day after one bowl like this. If you want to put your family on a little financial diet, try serving this porridge few times a week. You could save some real money! This porridge doesn’t have to be topped with bacon, or even onions. There are other popular toppings, including bryndza or fried cabbage. Feel free to experiment with whatever you like. And if you don’t know what the number one national dish of Slovakia is, it’s bryndzové halušky. Another popular traditional dishes are bryndza pierogi, and strapačky. What is the white stuff under the onions be ontop of the porridge? That’s sour cream mixed with regular cream. Thanks for catching this omission! Fantastic! I will let you know how we like it! Awesome! Fučka is quite delicious, especially with that crunchy onion. Make sure to to fry it until it starts turning black, but on low heat so you don’t burn it. Thank you for the recipe! This sounds like it. I will also send it to my sister. I made this yesterday and left out the onion and bacon, much to my surprise it was exactly what I have searched for for a very long time. THANK YOU!!!!! Excellent, glad to hear that. But next time, try it with the onion (even if you leave the bacon out). To me, it’s the caramelized onion that gives fučka it’s unique taste. lol….my husband made the same comment to me!!!! guess next time I WILL use the onions in it. This looks great, when do you add the milk? The milk went in after adding the liquid back in – basically the 3rd set of pictures from the top. Great, thanks! I can’t wait to try this one out. Thank you for this recipe. It is exactly what my sister and I were looking for. I did add the onion and bacon on top and it was the perfect touch. I can’t tell you how many years we have tried to find this recipe. My mother used to make this dish quite often growing up but i haven’t had this dish for years. I want to make it soon as it will bring back a lot of memories. Thanks for the recipe. 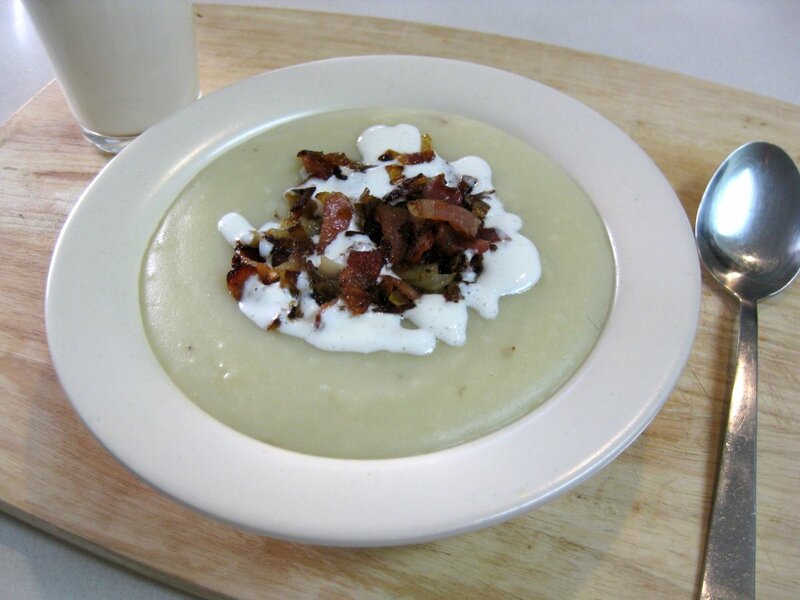 We normally had it with just fried onions – no bacon. Wow, this brings back memories of my Mom making it for us when we were growing up in Velke Rovne, thank you for the recipe. I can’t wait to try it. I want to try this, but how many servings does this recipe make? Also, I like the Virginia Tech mug you’re using in those photos. C/o 2008 here. How do you properly pronounce the name of this dish? I am making a Slovakian dinner next week and am very interested in making this, but I do not want to make a fool of myself and attempt to pronounce it because my tendency is to say it phonetically. I am just wondering…I’m also making Uhorkovy and Morcacie Plnene Prsia and could use some help with those, too…thanks! FUH-chka. The č letter is pronounced like “ch” in cheese. Uhorkový Šalát (cucumber salad) would be quite the way it’s written. The ý is a long letter “e” sound and šalát is shalaat. The last one is morčacie plnené prsia. Again, you have the soft c like in cheese and a long é, with the “e” read like in “pen” but longer. Thank you so much…I really appreciate your help! Look forward to some blog traffic next week as I will be directing my readers over here to get a lesson in Slovak cooking. Again, thank you! Hello! I wanted to say that I made this last night as part of our supper, and it was very good! I made it pretty much exactly as described, and it turned out almost exactly like the pictures. Collin, we have six people in our family, so I doubled all the components of this recipe. We ended up with enough for everyone (using this as a side dish) and leftovers for lunch for a couple of days. My guess is that you’d be fine if you made it with one potato per person you expect to feed, and adjust amounts accordingly. 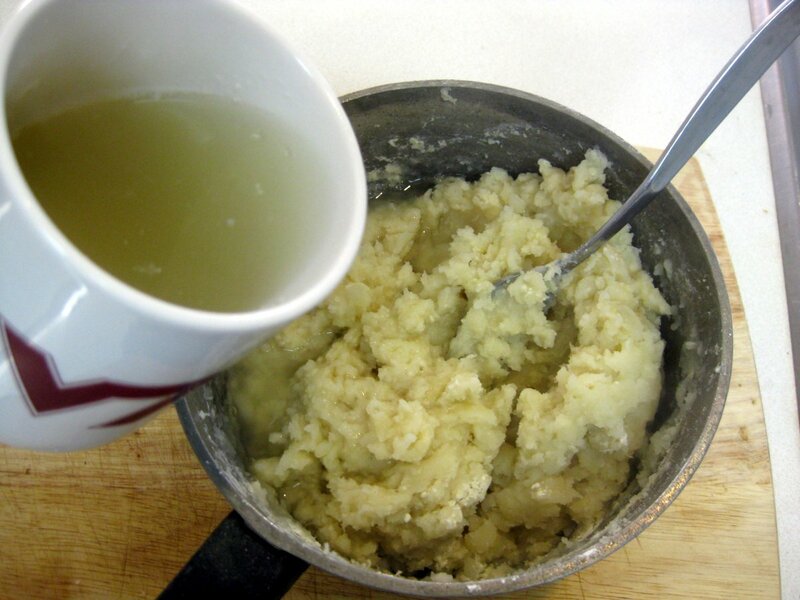 Also, It seemed to work very well with one cup of milk and one cup of potato water for every 4 potatoes, but a little less might have worked, too. As with all wonderful, traditional peasant food, this one is really versatile, flavourful and filling. My wife’s family is from Zakarovce, which is in the Kosice region of Slovakia, and this meal reminded me of visiting her Grandmother. I took step-by-step pictures of the process and will post them at my website, which is dedicated to international cuisine. I will of course give full credit to your site, Lubos, and will provide a link for people to see your wonderful creations. Keep up the good work! To all: this si some good, old-time eating ~ I recommend it to anyone who wants to take a trip to Slovakia! I should say, they were ORIGINALLY from Zakarovce – they emigrated to Montana soon after World War 1. 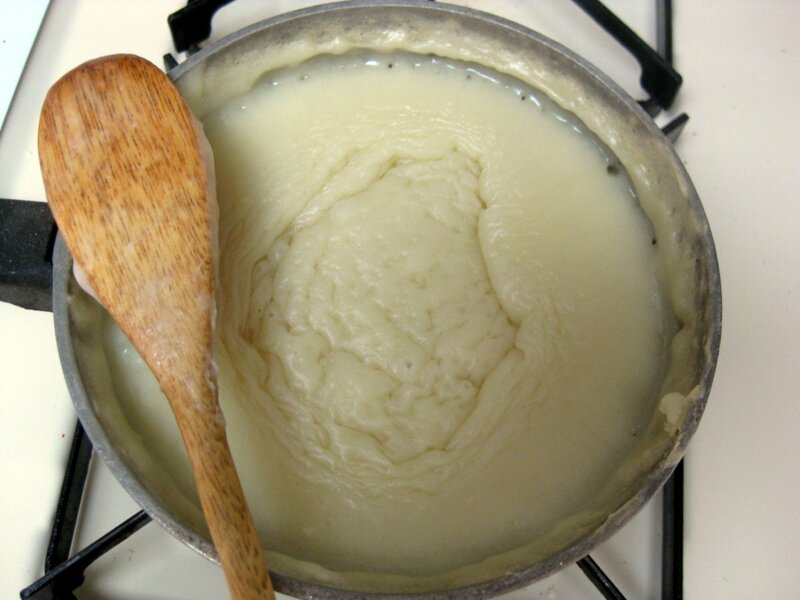 I was sure to give you credit, and also provided a link to this recipe, and also to your main page – I hope that this generates some traffic for you and spreads the Slovak-cooking gossip! I can’t say it enough – this was truly delicious! 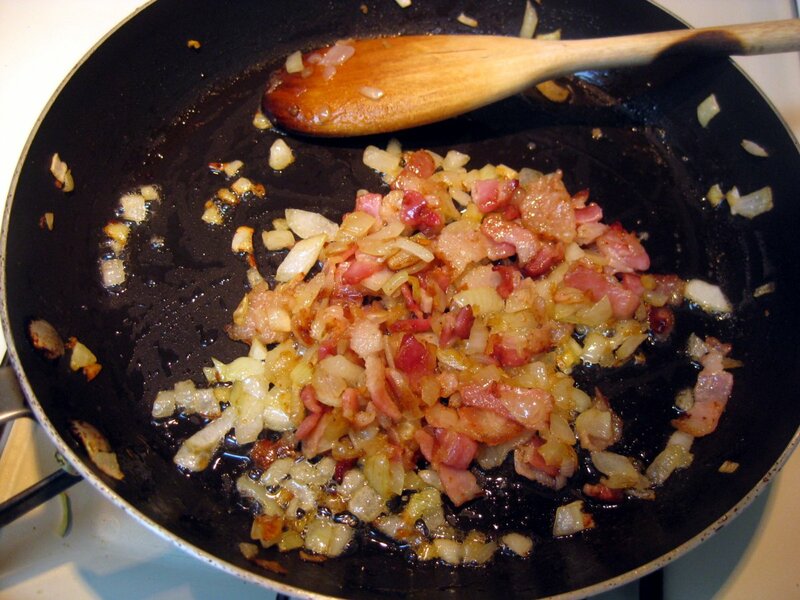 potatoes, bacon and onions ~ there is nothing better! I hope I did your recipe justice, and once again offer my thanks. We will be making your poppyseed and nut rolls this weekend, and I plan to make your homeade sausages and jaternica soon, also – will keep you updated. To all – if you haven’t tried this, you are missing out! How to you keep this from popping all over the stove top?